Helping our clients solve the challenges of the transportation industry requires knowledge of the latest engineering techniques, innovative approaches and the proven ability to deliver on schedule. 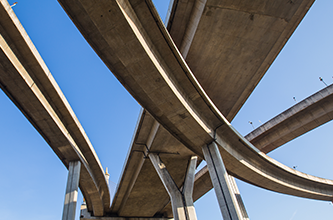 ECS provides services to our transportation clients in a variety of core areas including complex geotechnical engineering and environmental services in support of bridge, roadway, mass transit, airport, and port expansion projects. Our geotechnical expertise ranges from baseline or feasibility studies to fully developed Geotechnical Engineering Reports for Design-Build and Design-Bid-Build projects. We offer environmental services for land acquisition and permitting support for DOT roadways and air and rail clients. We also offer support with Construction Materials Testing, Quality Control/Assurance (QC/QA) field and laboratory testing, and support Construction Engineering and Inspections (CEI) contracts for roadways and bridges. Our expertise and ability to utilize personnel across multiple markets and geographies enables us to provide a full range of planning, design, development and observation services to both the public and private sectors.